Here you will find links to websites that will provide you with all the information you will need when planning a trip to the Long Beach Peninsula. This websites has tons of information on the Long Beach Peninsula. Check out their calendars and listings of fun events that take place on the Long Beach Peninsula. This is the official website for the WA State Department of Wildlife. You will find information about fishing seasons, limits and licensing requirements. Remember, The Seaview Mobil Station sells fishing, shellfishing and hunting licenses. Jake's Free Museum is a must see attraction in Long Beach. 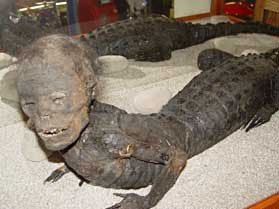 It is the only place in the world you can see Jake the Alligator Man. Jake recently turned 75 years old! Check out this site before playing all the fun scratch lottery games at the Seaview Mobil Convenience Store. This site shows the games with the best odds and how many prizes are still remaining. Be an informed gambler! THC Organic Market has all the best natural and organic food. It is a great place to stop on the Long Beach Peninsula. You can load up on all the fresh, natural and organic foods to bring back home. Reference this calendar for all the big events that happen on the Long Beach Peninsula. A very informative museum where you can learn about the history of the Long Beach Peninsula area. Visit the Cranberry Museum and learn both the history of the garnet colored cranberry as well as key phases of the industry from bog preparation and planting to marketing cranberry products.